French fries are elevated to a whole new level when you cut potatoes into thick wedges, batter them and deep-fry them in hot oil. Battered and fried potato wedges are widely available in several chain and fast-food restaurants across the country, but you don't have to spend money eating out to enjoy them. You can just as easily make them at home, adjusting the flavors exactly to your liking. Slice washed potatoes into 1/2-inch thick wedges on a clean cutting board. You can opt to peel the skin from the potatoes if you prefer, but it is not necessary. Place the potato wedges in a microwave-safe bowl and cover them with water. Cover and microwave the potatoes for about five to seven minutes, or until they are slightly tender but still firm enough to pick up with a fork. Combine flour with milk, an egg and seasonings such as salt, pepper, garlic powder and chili powder to create a batter. Use 1/4 cup of milk for every 1 cup of flour. You can also opt to use buttermilk instead of regular milk, or add 1/2 cup of your favorite beer. Add or decrease the amount of flour as necessary to maintain a thick batter. Heat vegetable oil in a deep fryer or pot with high sides to 375 degrees Fahrenheit. Fill the fryer or pot no higher than halfway with the oil. Dip the wedges in the batter, tossing carefully to coat, then carefully lower them into the hot oil and fry for three to four minutes, until they are golden brown and crispy. Work in batches if necessary so as not to overcrowd the fryer. Remove the fried potato wedges from the oil with a slotted spoon and drain on a plate lined with paper towels. Add more salt and pepper to taste and serve hot. 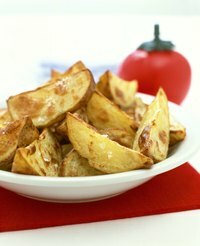 You can bake the battered potato wedges on a baking sheet in the oven as a healthier alternative to frying. Place directly under the broiler during the last five minutes of cooking to get them as crispy as possible.